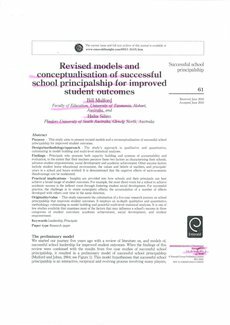 Purpose – This study aims to present revised models and a reconceptualisation of successful school principalship for improved student outcomes. Design/methodology/approach – The study's approach is qualitative and quantitative, culminating in model building and multi-level statistical analyses. Findings – Principals who promote both capacity building and systems of accountability and evaluation, to the extent that their teachers perceive these two factors as characterising their schools, advance student empowerment, social development and academic achievement. Other success factors include student home educational environment, the values and beliefs of teachers, and principals' years in a school and hours worked. It is demonstrated that the negative effects of socio-economic disadvantage can be moderated. Practical implications – Insights are provided into how schools and their principals can best achieve a broad range of student outcomes. For example, the most direct route for a school to achieve academic success is the indirect route through fostering student social development. For successful practice, the challenge is to create synergistic effects; the accumulation of a number of effects developed with others over time in the same direction. Originality/value – This study represents the culmination of a five-year research journey on school principalship that improves student outcomes. It employs an in-depth qualitative and quantitative methodology culminating in model building and powerful multi-level statistical analyses. It is one of few studies available that examines most of the factors that may influence a school's success in three categories of student outcomes: academic achievement, social development, and student empowerment.